Begin by making the polenta chips. Lightly grease a 20cm (8 inch) square cake tin and set aside. Place the stock in a large saucepan over medium heat and bring to the boil. Gradually whisk in the polenta, in a steady stream (don't dump it all in at once), and whisking continuously for 2–3 minutes or until thick. Remove from the heat and stir through the parmesan. Pour into the cake tin carefully smooth the top. Refrigerate for 2 to 3 hours, or overnight, until set. Preheat the oven to 200 celsius (400 Fahrenheit) and line a baking tray with baking paper or parchment. Remove the polenta from the tin and cut into thick chips. Arrange on the prepared tray and lightly brush with half the olive oil. Bake for 15 minutes and turn the chips and lightly brush with remaining olive oil. Return to the oven and bake until crisp and lightly browned, approximately another 15 minutes. Sprinkle the chips with sea salt and toss to coat. When the chips go in the oven prepare the bearnaise sauce. To make the bearnaise, place the shallot, tarragon stalks, half the tarragon leaves, vinegar, white wine and peppercorns in a saucepan. Bring to a boil and reduce until about 1 tbs in volume. Strain the liquid through a tea strainer, and press the tarragon leaves and stalk to get all of the liquid. Set aside to cool slightly. Place a saucepan of water over a medium heat and bring to a gentle simmer. Place a heatproof bowl over the top of the pan of simmering water (ensuring the bowl does not touch the water) and add the egg yolks and water, along with the tarragon vinegar. Whisk constantly until the mixture thickens and doubles in size start adding the cubes of butter, one at a time, until all the butter is absorbed. Taste and season with salt and pepper along with lemon juice. Just before the chips are ready preheat 2 large frying pans over a medium high heat. 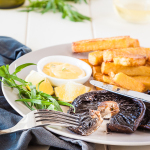 Lightly brush the mushrooms with olive oil and sprinkle season with salt and pepper. Cook for 3 to 4 minutes each side, until cooked through and lightly charred. Divide the mushroom steaks and polenta chips between 4 plates. Add the remaining tarragon to the bearnaise and stir through. Serve with the mushroom steaks and chips. The polenta for the chips can be made the day before, and cut into chips, and cooked just before serving.